Huge congratulations to Nicola for passing her Driving Test with an awesome 3 minors. 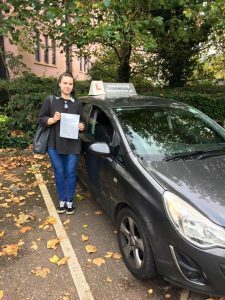 Nichola had Driving Lessons in Paignton with The Driving School sw, she over came her nerves on the day to achieve this super Driving Test result. Her Driving Instructor Rob who works for The Driving School sw was over the moon for her and said. “Well done and stay safe on the road”. For Driving Lessons in Paignton, Torquay, Brixham, Newton Abbot & all surrounding areas contact www.thedrivingschoolsw.co.uk or call 01803640607. ? ?